We don’t mind waiting on the latest and greatest technology. We don’t mind standing in long lines for an item on sale, for a good deal. We don’t mind playing the waiting game on Black Friday and Cyber Monday. But, Sundays are treated a little bit differently. 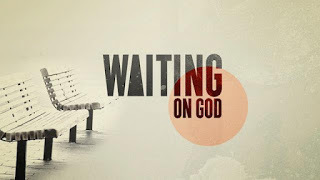 We don’t have time to wait for God, to wait on God. If He does not come between 11 a.m. and noon, then we’re leaving. Advent is all about waiting but we wait for One that we know is coming and God’s salvation is more than a good deal. But, when we don’t know how long, we can get tired of waiting, lose hope, begin to question and to doubt. We can start to believe that waiting is pointless, useless even. We stop looking, listening, praying. We lose the expectation. We can also lose faith. Still, anticipation breeds excitement and with it, expectation. When we know what we are waiting for, we begin to create the experience, to practice the feelings, to rehearse the moment when the wait will be over. We can be encouraged by the mere thought of it. And we know Who we are waiting for. Many persons have speculated as to his appearance but we really don’t know what Jesus looks like. Yes, he was a Jew and we can imagine his features based on the Jewish people of today. But, John tells us that “the Word became flesh,” which means that the Word is not flesh (John 1.14). John also tells us that God is Spirit (John 4.24). God is Breath, Wind even and we cannot see either. It is not a knowledge based on what we see or even what we know. It comes whether we see it or not. And “the wind blows where it chooses and you hear the sound of it but you do not know where it goes” (John 3.8). We are not in charge of the Wind; we cannot tell it what to do. We don’t know its comings or goings. Well then, how can we know when God will return? We cannot. Jesus said, “But about that day and hour no one knows, neither angels of heaven, nor the Son but only the Father” (Matthew 24.36). Perhaps, it is no consolation to know that Jesus does not have the schedule because he is with God. He is God (John 1.1). But, we too are with God. Life is a waiting room. We do not walk the floors of this life alone. We are not pacing but following in the footsteps of Christ. May this truth bring us peace until He comes. Amen. Waiting is hard, especially in this instant culture. The best gift is the one that is anticipated yet it’s a surprise. I really appreciate your writing. Love your thoughts and you. We certainly agree and I have remind myself to be still sometimes. Thank you for the love. I love you too!